Complete Internet Repair is a cool utility which helps you repair common networking programs which generally have a negative effect on your Internet connectivity. This portable product is pretty handy, as you're not forced to install the product; this means that you're able to perform network-related repairs on a system which overwise is already under the weather. With that said, no changes to your Windows Registry will be made. The main interface of the program is pretty simple and doesn't have much to it. Version 5.2.3.4010 is a freeware program which does not have restrictions and it's free so it doesn't cost anything. 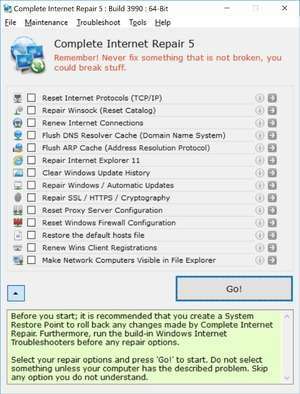 For security reasons, you should also check out the Complete Internet Repair download at LO4D.com which includes virus and malware tests. Additional screenshots of this application download may be available, too. Complete Internet Repair has a presence on social networks.